Wanna feel like a baller, even on a humdrum weeknight? Make meatballs! These ground beef baubles have everything to make dinner a success. The meat is mixed with Tuscan herbs for just the right amount of Italian-style flavor. 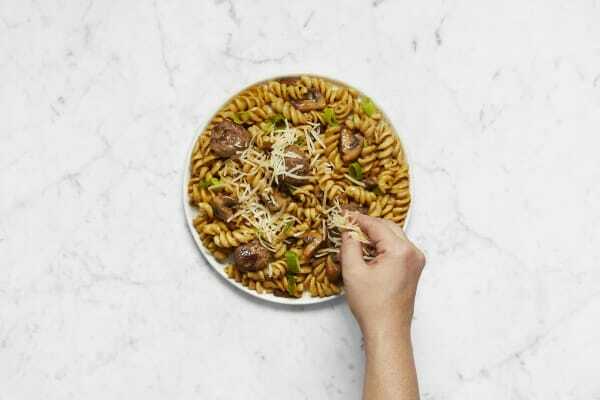 They’re then nestled into fusilli pasta bites with mushrooms and a savory sauce. Once you plop everything onto your plate and give it a sprinkling of Parmesan, you’re ready to slam dunk your way toward another mealtime win. Wash and dry all produce. Bring a large pot of salted water to a boil. 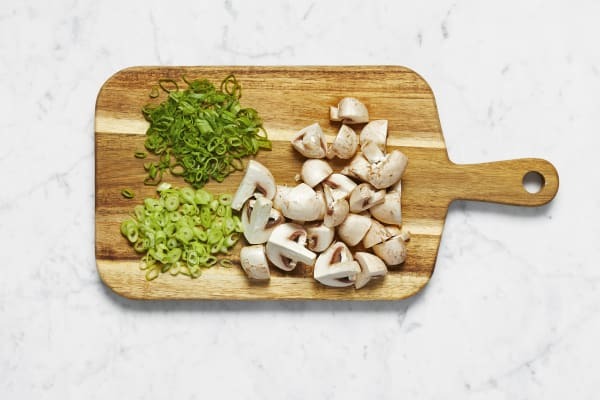 Trim and quarter mushrooms, cutting any large pieces into smaller ones. Trim, then thinly slice scallions, separating greens and whites. Heat a large drizzle of olive oil in a large pan over medium-high heat. In a medium bowl, combine beef, scallion whites, and half the Tuscan Heat Spice. Season with salt and pepper. 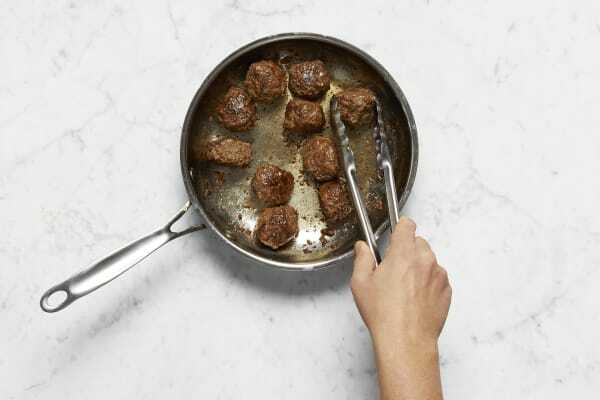 Shape into 8-10 meatballs. Add to pan and cook, turning occasionally, until browned and desired doneness is reached, 5-7 minutes. 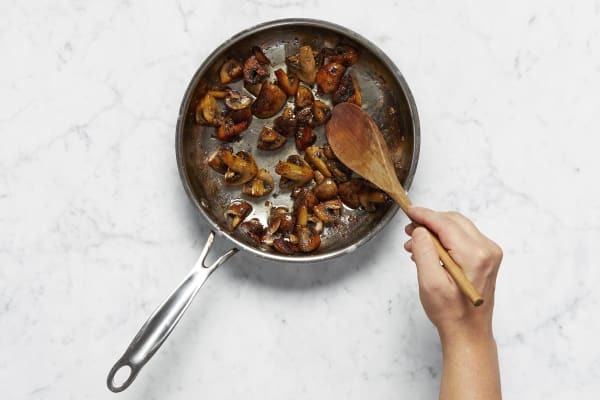 Remove from pan and set aside on a paper-towel-lined plate. 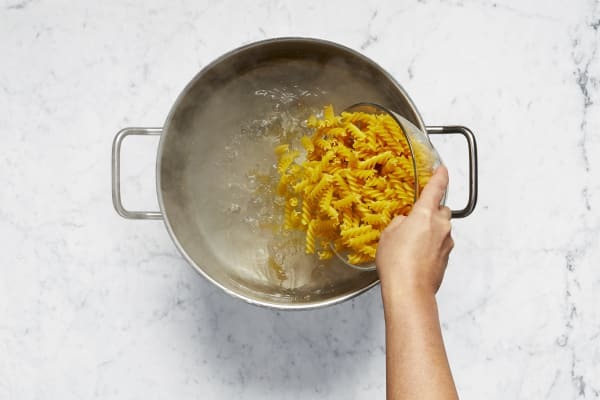 Once water boils, add fusilli to pot. Cook until al dente, 9-12 minutes. Scoop out and reserve ½ cup pasta cooking water, then drain well. Return pasta to pot along with 1 TBSP butter and toss to melt. Season with salt and pepper. Heat a large drizzle of olive oil in pan used for meatballs over mediumhigh heat, then add mushrooms and remaining Tuscan Heat Spice. Season with salt and pepper. Cook until browned and crisp, 6-8 minutes. Remove from pan and set aside. 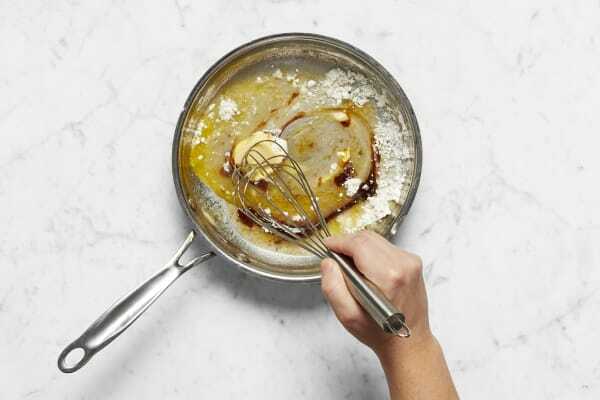 Wipe out any excess oil in pan. Lower heat under pan to medium and add 1 TBSP butter. Once melted, add flour and stir to combine. Cook 1-2 minutes. Stir in stock concentrate and ¼ cup pasta water. Season with a pinch of nutmeg (between ⅛ and ¼ tsp—use the rest as you like), salt, and pepper. Whisk to combine and simmer until thickened, 3-6 minutes. 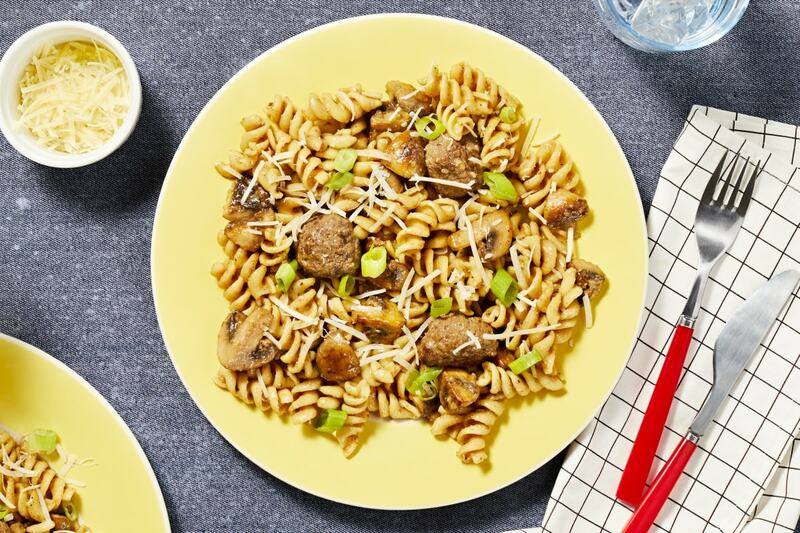 Gently stir fusilli, meatballs, and mushrooms into pan. If sauce seems dry, add more pasta water 1-2 TBSP at a time until pasta is coated in a loose sauce. Season with salt and pepper. Divide between plates. Sprinkle with Parmesan and scallion greens.